What Are The Chances That Tick Gave You Lyme Disease? : Shots - Health News The chance of catching Lyme disease from an individual tick ranges from zero to roughly 50 percent. Three factors matter: the tick species, where it came from and how long the tick was feeding. A blacklegged tick like this one can be hard to spot. Nick Berndt found himself in that exact situation earlier this summer. Berndt, 26, of Lancaster, Pa., felt a tick attached to his scalp three days after disc golfing in a forest near his home. "Obviously, Lyme disease was my main concern with it," Berndt says. "It's not something I wanted to mess around with." Berndt spent his childhood in southeast Pennsylvania but moved to California to study business administration at San Diego State. After graduation, he stayed in Southern California to manage a photography business, but he missed being close to his family and moved back to Lancaster in June. Berndt had experience with ticks growing up in Pennsylvania, and he knew Lyme was a local threat. But he was unsure whether this particular tick posed a significant risk. Berndt's situation isn't unique, says Thomas Mather, a professor of public health entomology at University of Rhode Island and the director of Tick Encounter, a free service that connects tick-bite victims with tick experts. Mather estimates that ticks bite millions of Americans each year, but only 30,000 cases of Lyme disease are reported to the Centers for Disease Control and Prevention annually. How do you know if your particular bite represents a high-risk case? As it turns out, the chance of catching Lyme disease from an individual tick ranges from zero to roughly 50 percent, according to Mather. The exact probability depends on three factors: the tick species, where it came from and how long the tick was feeding. First, Mather says it's important to identify the species of tick. 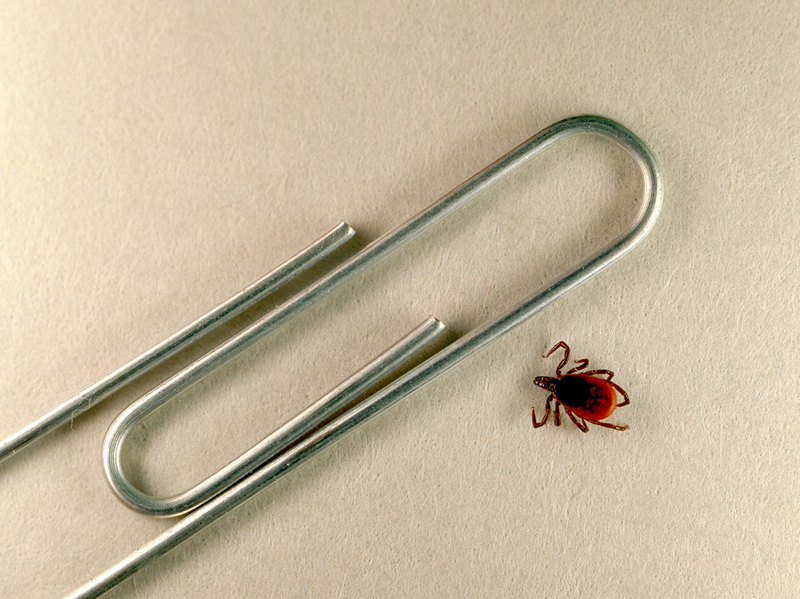 Only two species of tick transmit Lyme disease, both from the genus Ixodes. The blacklegged tick (Ixodes scapularis), often referred to as the deer tick, is found throughout the U.S. east of the Rocky Mountains. The Western blacklegged tick (Ixodes pacificus) is found west of the Rockies. Adults of both species have reddish-black bodies and are about the size of a sesame seed — smaller than most other ticks. As juveniles, they're even tinier — roughly the size of a poppy seed. If you've been bitten by something other than a blacklegged tick, you can stop worrying about Lyme. But Mather cautions that you may be at risk for other, less common infections, like Rocky Mountain spotted fever. Even if a blacklegged tick bit you, there's still a good chance you're OK. That's because only a fraction of blacklegged ticks carry the bacteria that cause Lyme disease. Where you live determines how many blacklegged ticks are carrying Lyme. A recent study found that in the Northeast and Upper Midwest, up to 50 percent of blacklegged ticks are infected. But in the South and West, infection rates are usually less than 10 percent. If you've been bitten by a blacklegged tick carrying Lyme you still might not get sick, says Rick Ostfeld, a disease ecologist at the Cary Institute of Ecosystem Studies in New York. "The probability that it [Lyme disease] is transmitted to you ... depends on the length of feeding," Ostfeld says. "It looks like something on the order of 24 hours is required before transmission occurs." The Centers for Disease Control and Prevention gives a longer time frame for transmission. "In most cases, the tick must be attached for 36 to 48 hours or more before the Lyme disease bacterium can be transmitted," the CDC website says. Alison Hinckley, a CDC epidemiologist specializing in Lyme disease, said several studies show that a tick "needs to be attached for 48 to 72 hours to even be able to transmit the infection to a person." Within a day of discovering the tick, Berndt submitted photographs and information about his case to Tick Encounter. Within 24 hours, a specialist informed Berndt that his case posed a high risk of Lyme disease. Why was Berndt's tick so risky? First, it was a blacklegged tick, a known carrier of Lyme disease bacteria. Second, the tick was in southeast Pennsylvania, where relatively large proportions of ticks are infected (Mather estimates that the Lancaster area has a 20-25 percent infection rate). Finally, the tick had been feeding for three days, much longer than the transmission threshold of 24 hours. As a precaution, Berndt went to a doctor and started an antibiotic regimen. He also paid a lab to have the tick tested. Fortunately, the test came back negative for Lyme disease. "I think the $50 [for the test] was worth it, just to be able to say 'No, it definitely wasn't carrying it,' " Berndt says. Even though Berndt's tick tested negative, Mather says it's still a good idea for people like Berndt to be on the lookout for Lyme symptoms. That's because they could have gotten other tick bites that went unnoticed. But Mather stresses that not everyone who finds a tick on their body needs to worry. Many cases have a low probability of causing disease. "There was one woman, she was nursing a 12-week-old baby and said, 'I just scraped this off my back and I'm scared,' " Mather says. "In her case, it was a barely attached American dog tick. We could tell her, 'You're probably fine.' "
An earlier version of this story said incorrectly that Thomas Mather is a professor at Rhode Island University. He is on the faculty of the University of Rhode Island.